That's right, Chandra is back! 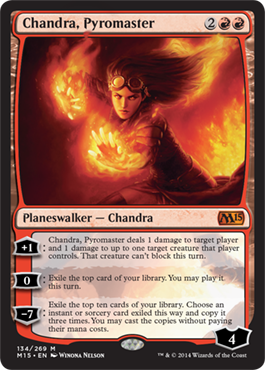 A lot of people consider this Chandra to be the most playable so many people are happy about this. Others wish that we would get new Planeswalkers all around, but we just got her and the community likes her. Many people liked the other Garruk, but due to the storyline shift, there will be no more of Garruk, Caller of Beasts. The next card is a spoiler that Star City Games got, which is the last Soul from the six card cycle: Soul of Theros. As with the others, we get a 6/6 for six mana and it has Vigilance, a white ability. We also get two activated abilities, one of which is for the battlefield, the other is for the graveyard. This ability is absolutely amazing! It gives all creatures you control +2/+2 first strike AND lifelink for six mana. 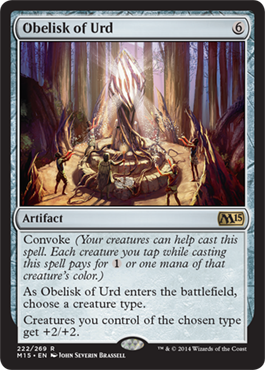 If this is paired with Elspeth, Sun's Champion, awesome things can happen for you. 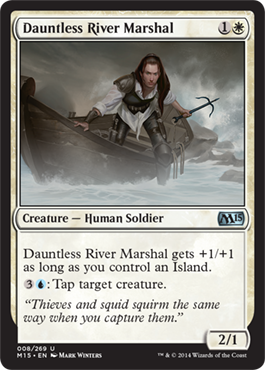 Dauntless River Marshal is the first card in a cycle that acts like Kird Ape. They're all uncommon and get +1/+1 for having a land with the basic land type next in the color pie (in this case, Islands). It also has an ability activated using the next color (in this case, Blue). So we have a 2/1 for two mana, gets +1/+1 with an Island under your control, and then can tap a creature for 3 colorless and one blue mana. These cards will be good in limited, I think. a three mana 1/3 with +1/+1 when you control a swamp and the ability to give a creature lifelink with one colorless and one black mana. Seems really good. Five mana for a 4/3 that gets +1/+1 with a Mountain (so really just a five mana 5/4, which isn't bad) and then an ability for four colorless and one red mana to deal two damage to a creature or player. That ability in itself is a ridiculous cost, especially that late in the game. 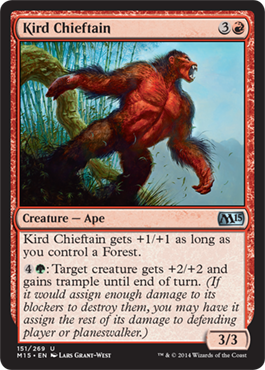 Kird Chieftain costs four mana and gets +1/+1 when you control a forest. So it's a 4/4 for four which already isn't bad, then can give a creature +2/+2 and trample for a turn for four colorless and one green mana. That ability isn't too bad. Maybe a little bit overpriced, but not too bad. 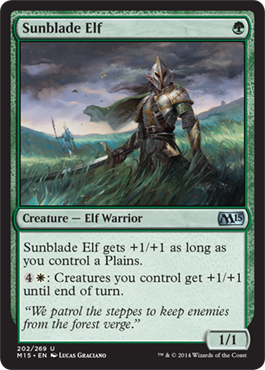 Last in the cycle is the one mana Sunblade Elf that gets +1/+1 with a Plains. For a white mana and four colorless mana, you can give all your creatures +1/+1 for the turn. 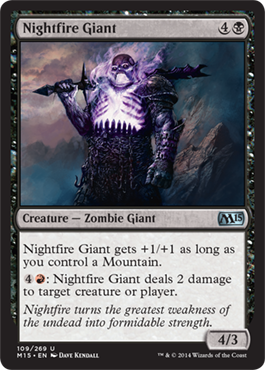 That's a little better than the ability of Kird Chieftain, and based on the number of creatures you will likely have by your fifth land, it's an appropriate cost, I think. 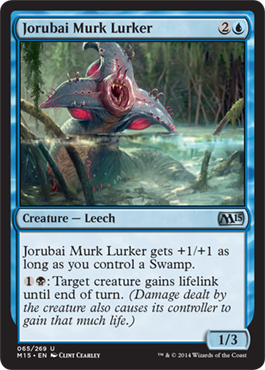 I think the best one in that cycle is Jurubai Murk Lurker. It's a cheap costing card and can give lifelink for a turn at a cheap cost. 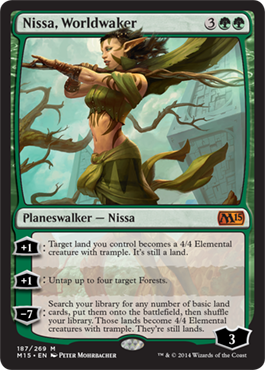 Nissa, Worldwaker! Sure, she costs five mana for a 3 loyalty (already she's okay), but she comes with two +1 abilities, the first makes a land you control a 4/4 Elemental with trample. It may not seem that great, but it isn't until end of turn, that land is just a 4/4 Elemental while still a land for the game. Think that was a ridiculous ability? The other +1 lets you untap up to four Forests. Shocklands still apply in this Standard (until September 26th), so you could untap some of those, but think about it... Play her, activate her second +1, and you have four more mana to spend. One way you could just make this ridiculous even more is if you put her in a Blue/Green deck and used Master of Waves. Then your 4/4 Elemental lands with trample become 5/5 Elementals with trample. This version of Nissa is far more playable from the last. Like her previous version, Nissa Revane, we get two +1 abilities, but this one is less specific to Elf tribal (something that does not exist in Theros block). She has a way to protect herself (using lands as creatures), and she even can accelerate your mana to cast spells costing 9+ mana seeing as she untaps four lands (counting the five used to cast her, you have options). She's really powerful as a Green Planeswalker, and I know this is a year ahead, but I hope we see her again in M16.